The warm and humid environment in the Atlanta, GA area contributes to rapid algae growth and infestation of all types of roofing materials including asphalt shingles, tile, cedar shakes and even low porosity roofing materials such as metal. 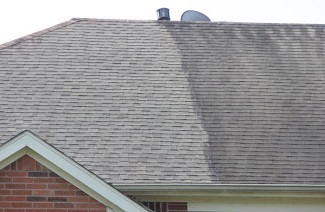 Unfortunately even if you have a relatively new roof, it will not be long before those ugly and unsightly black stains bed themselves into your roof and dramatically reduce the curb appeal of your home or business. Not only are they unsightly, these different types of algae can actually eat away at your shingles and ultimately contribute to a reduced life-span of your roof, leading to very expensive replacement costs easily in the thousands of dollars even for a small residential roof. Traditionally roofs in the Atlanta, GA area need to be replaced every 10 years, whereas with proper maintenance, they can easily last 2 or 3 times longer depending on the quality of the roof material. At 1080 Pressure Washing, we offer an affordable and effective roof cleaning and roof washing service to both residential and commercial clients in the Atlanta, GA area. Our soft-pressure approach along with out commercial chemicals will wash away the algae, mildew and mold build up on your roof and erase the unsightly streak marks.